I don’t remember much about the angel standing on her head but it was made at Canterbury along with many others. I remember the pottery that my father built out of nice old bricks, he was very happy working there. It was at the end of the drive at the back of our house in Canterbury. We all played in the back garden tumbling around on the grass outside the pottery, we were natural acrobats really doing summersaults and hand stands with our hair falling all over the place. We were an inspiration for him and he often asked us to pose. I specifically remember the ‘Acrobat’ pose with one arm in the air. We felt very excited by the attention from him and it all seemed such fun. Sometimes he gave us some clay to make things too, that was very special because it seemed so important when he was there making Angels and we felt part of it all. He loved the ‘sang de boeuf’ glaze which was found on a little pot after the fire that burnt my grandparents pottery to the ground, and he wanted to make something special with it, so he made Angels. I don’t know where he got the idea for creating the reduction in the firing but he threw moth balls in with spontaneous abandon, I think this spontaneous free spirit that he had allowed for amazing things to happen and the result was amazing in the case of the Angels. I remember the beautiful copper red shiny glaze. I have never seen anything like it. 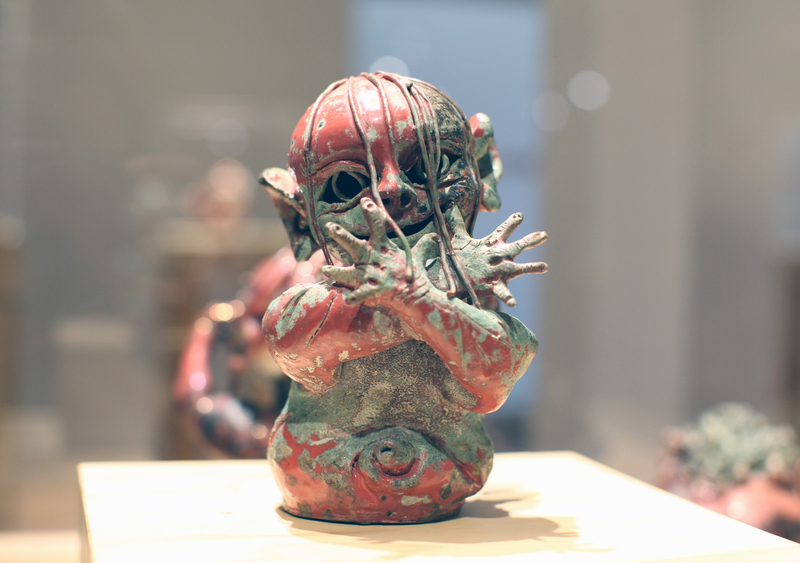 I loved the ‘Baby Angel’, so sensitively done with exquisite little fingers. Romulus and Remus another of my favourites, the idea of the ‘she wolf’ caring for the little human babies, a moving image. Although I don’t remember my father being around that much, he was often down at the pub, he was a humorous witty character, daring and slightly witchy if you like and I was fascinated by him he was both clever and handsome and he made a strong impression on my life. He was an incredible man. I have never met anyone else like him or seen anyone work the way he did. He loved the Angels as we all did and he may well have thought they were his greatest achievement.